Studies show over 50% of drivers who self-report are violators. A set of traffic lanes about to open in the East Bay represents a coming revolution in Bay Area freeway travel, affecting the choices drivers make and the gadgets they must carry with them. 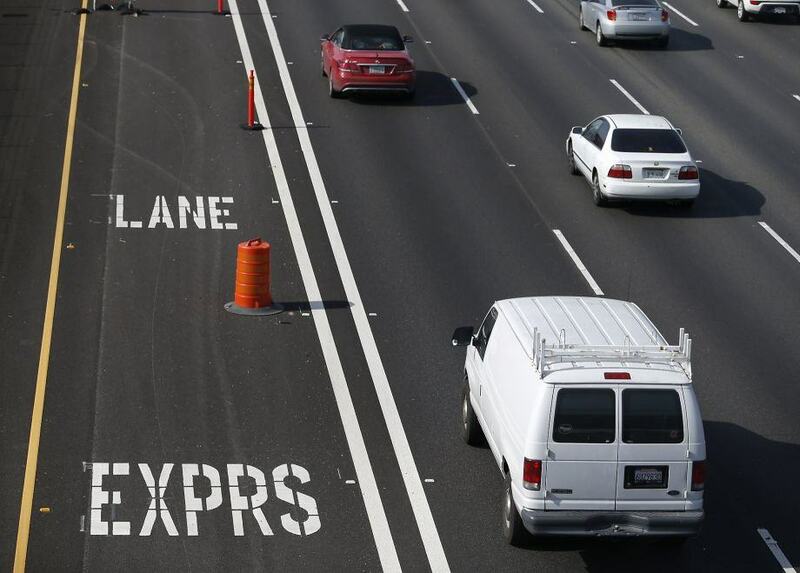 Express lanes — those carpool lanes that single drivers can buy access to if they’re desperate or wealthy enough — have so far been limited to short stretches or remote locations. But with the opening later this month of the I-580 Express Lanes through the Tri-Valley in southern Alameda County, the concept is inching closer to the region’s core commutes. And it’s about to spread, eventually becoming a 550-mile network designed to fill every empty inch of the freeways while keeping traffic flowing. The I-580 Express Lanes will reach from roughly the Interstate 680 junction in Pleasanton to Greenville Road in Livermore, a distance of about 12 miles. As with other express lanes — dubbed Lexus lanes by detractors who see a gift to the moneyed — cars with at least two occupants and those with low-emission decals can still ride for free during commute hours as a carpool. But solo drivers will be able to pay a toll that rises and falls with congestion, from $2.10 to $9 eastbound and $2.40 to $13 westbound. Unlike the Bay Area’s existing express lanes on southbound I-680 over the Sunol Grade and through the Interstate 880-Highway 237 interchange in Milpitas, drivers will be able to enter and leave the new express lanes almost anywhere they want. All drivers will be required to have a new or old-style FasTrak transponder to use the lanes. Carpoolers, though, must obtain a special “FasTrak Flex” transponder to get a toll-free ride. Carpoolers now have to stash their transponders in a Mylar bag to avoid being charged on express lanes. The new transponders, already in use in Southern California, feature a switch that allows drivers to indicate the number of occupants in a vehicle and relays that information via overhead toll readers. The I-580 Express Lanes — two eastbound and one westbound — have been under construction for at least three years, and use lanes built from the ground up to be express lanes. If it’s dry enough to finish testing and tweaking the electronics, and to paint new striping, the lanes will open sometime between Presidents Day and the end of the month. “If El Niño cooperates, we will be opening in February,” said Tess Lengyel, deputy director of the Alameda County Transportation Commission, which is building and operating the lanes. The lanes will be active from 5 a.m. to 8 p.m. Monday through Friday. Outside of those hours, they’ll be open to general traffic. The idea behind express lanes is to fill the capacity in underused carpool lanes with solo drivers who are willing to pony up for a quicker trip. Transportation engineers say the lanes benefit commuters by not only giving them the choice of buying a faster ride when they need it, but also by taking some of the cars out of the general traffic lanes. Critics counter that the lanes benefit only those who can afford the tolls, and question why drivers should pay again to use a road built with their taxes. Kandra Raj, the project manager, said the lanes aren’t just for the affluent, noting that they’re popular elsewhere with parents who want to make a day care pickup or a kid’s soccer game on time, or workers who bill by the hour, or college students who don’t want to be late for class. The Bay Area’s existing express lanes — on I-680 over the Sunol Grade and through the I-880 and Highway 237 interchange in Milpitas — carry hundreds of thousands of vehicles a year. According to a report from the Alameda County Transportation Commission, the I-680 lane has carried nearly 3 million toll-paying vehicles since it started in 2010. The Highway 237 lanes, according to the Santa Clara Valley Transportation Authority, have seen 2 million tollpayers since their 2012 start. 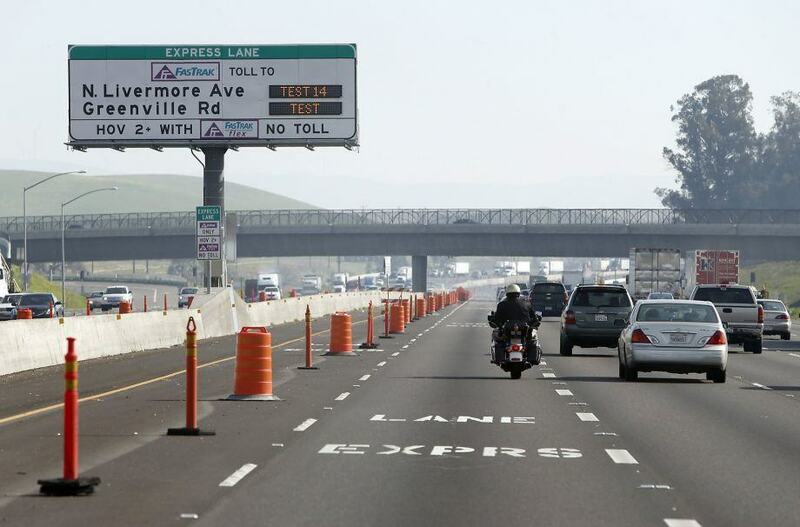 Like them or not, more express lanes are on their way — 550 miles of them in the Bay Area by 2035. Construction is already under way on the next set of express lanes in both directions on Interstate 680 between San Ramon and Walnut Creek. They’re scheduled to open in spring of 2017. The bulk of the Bay Area’s express lanes network will be on interstates 80, 680 and 880, and will be marched out mostly by converting carpool lanes that already exist, said John Goodwin, a spokesman for the Metropolitan Transportation Commission, which is coordinating the regional system. After existing lanes are converted, new express lanes will be built to fill in the gaps where there are no carpool lanes, he said. “It provides better access and increases capacity,” said Raj. He said his agency got a lot of complaints about the lack of free access to the lanes on the Sunol Grade. Interstate 580 is among the Bay Area’s busiest freeways, and ranks eighth on the MTC’s annual list of lousiest commutes. About 220,000 vehicles a day travel the highway through the Tri-Valley, which is not only a popular route between the Central Valley and the Bay Area but also a major cargo connection between San Joaquin Valley farms and the Port of Oakland. Some commuters interviewed in Pleasanton Tuesday said they were looking forward to the opening of the express lanes, even if they weren’t sure they’d use them. Jeremy Miller, a salesman who lives in San Jose, uses the I-680 Express Lanes regularly and is a fan. His co-worker, Kevin Perez, lives in Tracy and endures the I-580 congestion daily. But he’s not planning to pay his way into the fast lane yet.